A.C. Entertainment Technologies Ltd (AC-ET) continues its commitment to supporting local motor racing talent by becoming a premier sponsor for the Jack Goff Racing team for the second year running in the ELF Renault Clio Cup with Michelin. Making a successful début last year and finding his feet in one of the closest-fought motor racing contests in the UK, Jack is this year poised to challenge for the championship with his characteristic enthusiasm and determination. The ELF Renault Clio Cup with Michelin series – known for its nail-biting, wheel-to-wheel finishes – is the UK’s premier one-make saloon-car championship, featuring a 16 race season which runs from 2nd / 3rd April through to October. In addition to AC-ET, some of the most cutting-edge movers, shakers and technology companies from the professional entertainment world join the Jack Goff Racing sponsorship roster, including Avolites, HSL Group, J&C Joel, Litestructures, NEXO, Philips, Pixel Range, Robe, Rope & Rigging, Sennheiser and SES. Says AC-ET's Jonathan Walters, coordinator of the company's Jack Goff Racing sponsorship activity: "We're really pleased to be supporting Jack again this season. 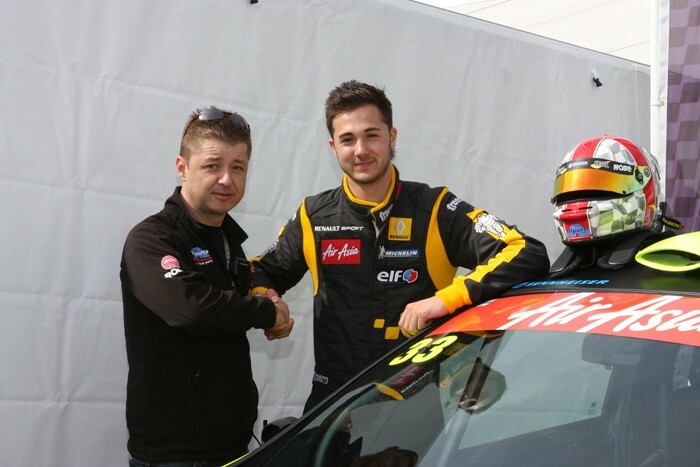 With AC-ET's existing motor racing links as a Patron of the British Racing Drivers' Club's (BRDC) Rising Stars Programme, it was a natural decision to sponsor Jack in his second year of the ELF Renault Clio Cup with Michelin. Along with the rest of the sponsors, I believe we have helped to give Jack the best possible chance of challenging for the championship this year. We wish him the best of luck competing in the 2011 race season." In picture: AC-ET's Jonathan Walters, coordinator of the company's Jack Goff Racing sponsorship, with racing driver Jack Goff.